Apartment Shangrila is a beautifully renovated penthouse apartment and is a fantastic property for large groups. However, given that this in a dated building, any type of noise travels very easily. Therefore we cannot accept rowdy groups to this apartment, or, any groups which include young children and toddlers as they tend to run around a lot inside. The noise and the vibration travels easily down to the apartments below causing issues. We do not accept responsibility for any complaints made. Comfortably sleeping nine people this two floor apartment is just a five minute walk from the centre of town and the Super Morzine Telecabine over the valley footbridge. There is also a free ski bus (Bus D) that passes outside the apartment block every 30 minutes. This connects you to the main lift stations and the village centre. This property has been finished to an exquisite and contemporary standard and has without a doubt one of the best (and sunniest!) views of Morzine and slopes of Pleney. – A large double bedroom with an ensuite shower room. – One further bathroom with bath and double basin. – Two additional storage cupboards. – A spacious living area. – Dining room with seating for 12 people. – Brand new modern kitchen. On the upper mezzanine floor there is a small living area with a dvd and Nintendo Wii. This is a bedroom area with three single beds. There is also a small bathroom and wc on this mezzanine level which is yet to be renovated. This has reduced headroom but it is good for children. The apartment block has other amenities which include; a ski store, table tennis room, large garage, and a small lift. In order to respect the other residents of the building, some of whom live here and work here full time, please observe the following. – Balcony doors to be shut after 10 pm. – Do not throw any objects, including cigarette ends off the balconies. – Please make sure the outside door is securely shut when you leave and enter the building. – The doorbell buzzer downstairs is marked GINN. Please do not disturb others by ringing the wrong buzzer. – The light switches in the stairwell glow ORANGE. Please do not disturb other residents by pressing doorbells by mistake. – Please do not run in the apartment. It creates noise in other apartments below. Apartment Shangri-La (D3)	standard bookings run from	Saturday	to	Saturday. Penthouse apartment located just 7 minutes walk from the Super Morzine footbridge and telecabine. A lovely spacious, sunny apartment which is spacious, warm and very well equipped with everything we needed for a great stay in Morzine. The apartment is well placed to access the Super Morzine lift and the views over the Pléney slopes are amazing. Our transfer from Geneva, booked through Alptitude ran very smoothly and our lift passes were waiting for us as promised. We would definitely return to this apartment for another family ski holiday. Super Sunny Shangri-la! Fabulous spacious apartment with ample space for relaxing. Large balconies making the most of the sun all day. Great views over Morzine and Pleney. Well stocked modern kitchen, including dishwasher and washing machine, which was perfect for our 3 week stay. Lovely and clean bathrooms and bedrooms. Especially the walk in shower. Only a minutes walk to free bus, but only 5 minutes to Morzexpress and 10 to Pleney on foot. It's in a quieter residential area but town is not far, which gives best of both. Secure underground parking and ski storage. Very helpful and professional company. Très bon séjour. 3eme fois dans cet appartement très bien conçu, tel que sur les photos. Moderne et fonctionnel. Grande terrasse. Garage pour 2 voitures. Vue superbe sur les pistes du Pleney. Proche centre ville. 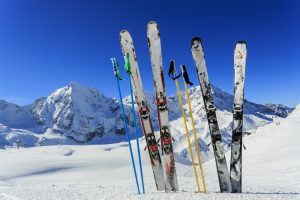 A 2 mn à pieds de la navette menant aux pistes. Valeur sûre. Nous reviendrons sans hésiter..
We stayed for a week at Apartment Shangri-La w.c 13.02.16. Party consisted of 4 adults and 4 youths ( boys ages 10, 15, 16 and 17). The accommodation was perfect for us, plenty of space, very comfortable and immaculately clean. The two eldest boys stayed in the mezzanine which was ideal for all concerned, the only slight problem was the height of the roof in the shower and wc as they are tall boys and so they used the bathrooms downstairs but this was not a problem. The kitchen is equipped with everything you need and more ( we never got to use the fondue set). 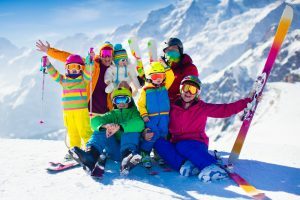 The apartment is a bit of a walk from the town centre, it took us at a steady stroll about 15 mins and on the way back its up hill but if you are fit enough to ski, hike or cycle around the PDS it's no problem. The nearest access to the slopes is the Super Morzine gondola, about 10 mins walk. We used Intersport for ski hire next to the lift so it was ideal. On the days we started skiing in Morzine we simply took the little train that drops you off at Pleney lift. All in all a fantastic holiday and great accommodation. We have already booked to return next year. Thanks to Ben, Beth and Pete. Our whole trip with Apltitude was great. On arrival, we had water bottles in the shuttle, something very small but was great after a long flight. The apartment was fantastic. Warm, spacious, comfortable, with incredible views. 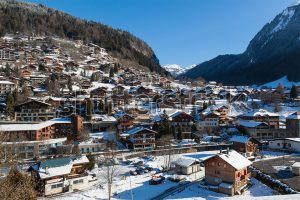 It is a short walk from Super Morzine Bubble, but a bus also passes nearby for Pleney lifts, not needed if you enjoy a small walk. Ben our host was very accommodating and pleasant. Would recommend certainly. Will be looking again for next year. We stayed at the Shangri-La in January as a party of 9 with 3 families including 4 children aged between 12 and 6. The apartment had everything we needed, it was a home from home, the washing machine and dishwasher were really useful. The apartment is decorated to a very modern standard with 2 large tvs with freesat, sufficient bathrooms and storage for all of us, it has great views of the pleney, we were lucky on Thursday night to see the torchlite descent by the ski instructors followed by fireworks which were great. There was plenty of space for all of us to get ready for the days skiing and the children loved the extra space on the mezzanine floor. The walk across the bridge to the town takes a maximum of 10 minutes with children ( can recommend the restaurant just the other side ). We used the bus to get to the ski lifts and ski school each day (would recommend the esf piou piou club for younger children) The bus timetable was in the apartment with plenty of other useful information. We booked the transfers through Ben and it worked very well, we were transferred to and from the apartment with ease, we were able to leave our luggage with them on our last day for â‚¬5 a bag which helped as we had a later flight. we found the alptitude website really easy to use with useful information to book our self catering holiday, ben was very helpful throughout the holiday with some problems we had and we would definitely stay in the Shangri-La again! Great holiday and didnt want to come home. Fantastic views by day and night from the lounge / dining room in this very well equipped apartment. The decor and fittings are to a high standard, beds were super comfy, plenty of hot water for soaking aches after a day on the slopes. Only negative was that the heating system in the living area is a series of floor level, metal covered vents running the length of the main window and the metal gets extremely hot - not ideal if you have young children crawling / toddling around. The D bus stop is a few minutes (max) walk from the apartment if you don't fancy walking back up the hill in your ski boots. Ben was very helpful and we would definitely recommend both the apartment and Apltitude to friends.